A crowd gathers to protest Berks County family detention center. When the vigil began, detainees could be seen outside the facility playing baseball and sitting among some outdoor tables. Initially, there was little security — only two guards on the top of the building and one Berks County police car parked nearby. The beginning of the vigil included a former Berks detainee sharing some details about her experience, as well as a group singing of “This Land is Your Land.” About 15 minutes into the vigil, there was some commotion as attendees became aware that an act of civil disobedience was taking place. On the entrance road to the detention center, a group of activists sat in a circle in the middle of the street, blocking the one-lane entrance. Police cars quickly descended on the road entrance, parking on either side of the protesters’ circle. The group did not make any aggressive actions, and the whole time stayed seated in their circle. A group of attendees at the vigil split off from the main area of speakers to protest the presence of police and support the group risking arrest. They shouted chants like “Shut Down Berks!” and “Abolish ICE!” as they held signs aloft with similar messages. Over the course of about 30 minutes, between 10 and 15 police vehicles arrived and parked along the entrance road. The police arrested every person who was seated in the road, roughly 17 people. Only one counter-protester made himself known at the vigil. He was a middle-aged white man who wore a shirt that read “White Lives Matter” and carried a printed sign that claimed: “Trump separates children from Jew [sic] pedophiles.” He shouted a similar sentiment at attendees of the vigil, screaming, “Trump separates kids from pedophiles.” A few protesters engaged him in a verbal match before several police came over and escorted the man away from the vigil. He was not arrested and left shortly after. The vigil continued amid all these activities. It included several more songs, including “Never Turning Back” in English and Spanish. Several statements from former and current detainees were also shared; these statements recounted how some of the families had been detained for nearly two years at Berks County detention center. A Brazilian father currently being detained at the center wrote that he was separated from his son (who is nine years old) for several months before immigration reunited them at the detention center. While he is happy he is with his son again, the father explained that he still fears they will be deported. The organizers also accepted donations throughout the vigil, collecting backpacks, small toiletries, and bilingual books, which they are able to get to the families still being held in the facility. 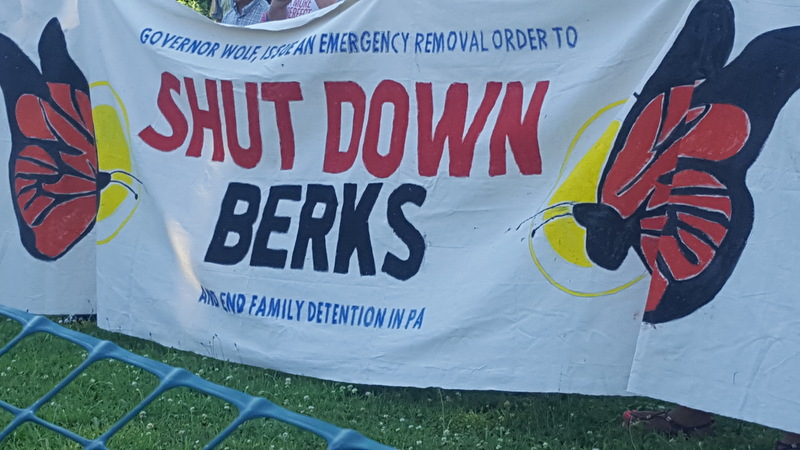 As the vigil came to an end, organizers from the Shut Down Berks Coalition encouraged attendees to contact the governor’s office and demand that Governor Wolf issue an Emergency Removal Order to close the detention center. You can contact Governor Wolf at 717-787-2500, and contact Pennsylvania Department of Human Services Secretary Teresa Miller at 717-787-2600. You can also write a letter to the governor’s office: 508 Main Capitol Building, Harrisburg, PA 17120. To stay informed about future vigils and events around the Shut Down Berks campaign, follow the Shut Down Berks Coalition and Shut Down Berks Interfaith Witness on Facebook. If you would like to donate to the Shut Down Berks Action Fund, you can do so by going to the Free Migration Project and clicking the Shut Down Berks Campaign donation button. The next Shut Down Berks vigil will be Sunday, August 12, from 3:30 to 4:30 pm at 1040 Berks Road, Leesport, PA 19533. The organizers do their best to coordinate rides and carpooling for people, as the detention center is very difficult to get to via public transportation. Please contact them through Facebook if you can be a driver or need a ride to the event.